The vast western plains of the inland have proved to be an excellent place for cotton growing. In fact, Wee Waa is one of the world’s largest and most profitable cotton-growing areas of all time. There is also wheat-growing and grazing in the area, and various seed crops, which help to support the local rural community. 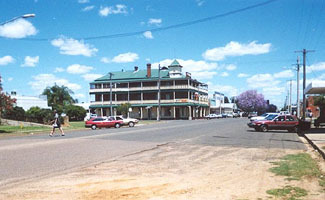 The town is situated west of Narrabri, in the fertile Lower Namoi Valley, with both the township itself and the surrounds having a population of about 2,000. It also services the greater rural community of Burren Junction, Pilliga and Gwabegar being around 40 kilometres off the Newell Highway, and is near the townships of Walgett, Collarenebri, Lightning Ridge and the opal fields. However the region is prone to extremes of temperature, with the average Summer minimum being 17 (centigrade) and the maximum being around 37 - although it often goes well into the forties. The average winter minimum and maximum temperatures are 3 and 17 respectively. Rainfall can be around 635 mm annually, although the timing varies greatly, leaving the area prone to both droughts and floods. Wee Waa is supposedly the Aboriginal name for "roasting fire", and this name comes from the language of the Kamilaroi people, who were the original inhabitants of the land. It was one of the first white settlements on the banks of the Namoi River, being established around 1837. Although it is now an agricultural centre, it was once a venue for all court and legal proceedings in the inland - for approximately ten years from 1846 - 1856. Subsequently such matters were transferred to Narrabri and Walgett as settlement grew in those areas. In the latter part of the 1800’s, as time went on, and more land was cleared, more settlers entered the area. Wee Waa became established as a principal agricultural supply centre, to cater for the needs of the cattle and sheep farmers, as well as for the cultivators of cereal crops. In the Pilliga Forest, timber cutting became a local industry, and there were several operations in the area around Gwabegar. However, development remained reasonably slow until rail services were extended in 1901 from Narrabri to Walgett, passing through the town on its route. In the 1900’s, the rural community started to grow, so a group of local graziers instigated the Wee Waa Show movement in 1912. However war and depression delayed the staging of the first show until 1927 unfortunately, but then it became a successful annual event. The town continued to develop, despite repeated flooding and the destruction of main street buildings by fire. During the 1900’s, to meet the needs of the community, schools, parks, shops, pubs, clubs, and sporting grounds were all constructed. These have all contributed to the making of Wee Waa as the successful rural centre it is today.